Yep, I have a thing for shortbread. Salted caramel is my main love, but I keep coming back to these little buttery, crumbly, not-too-sweet bundles. 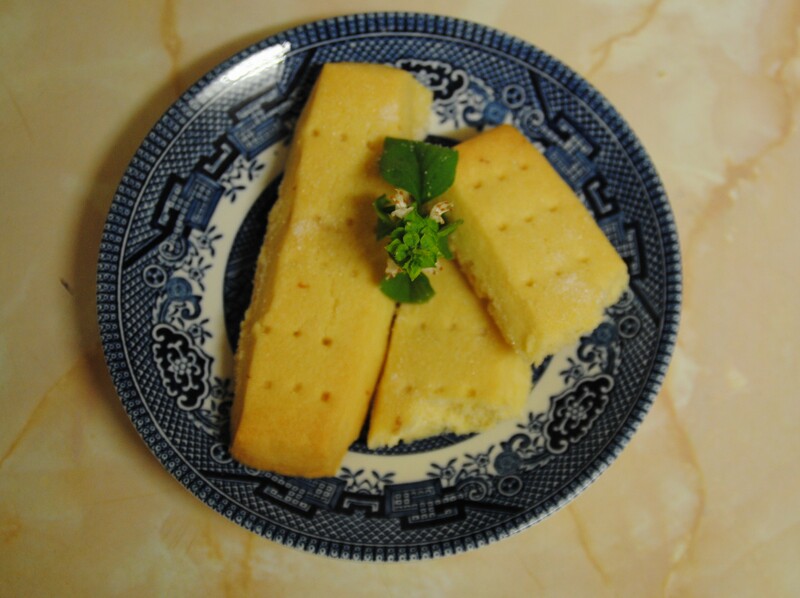 This recipe is adapted from one of my earlier posts for Basil Flower Shortbread, and works on the same principle- working an unexpected flavour into a familiar base. You can incorporate as much or as little (or indeed, none) of the floral element as you like, by adding or omitting the Lavender oil and flowers. I bought my Lavender oil from my local chemist, it’s not too expensive and is also really nice to add to caramels. 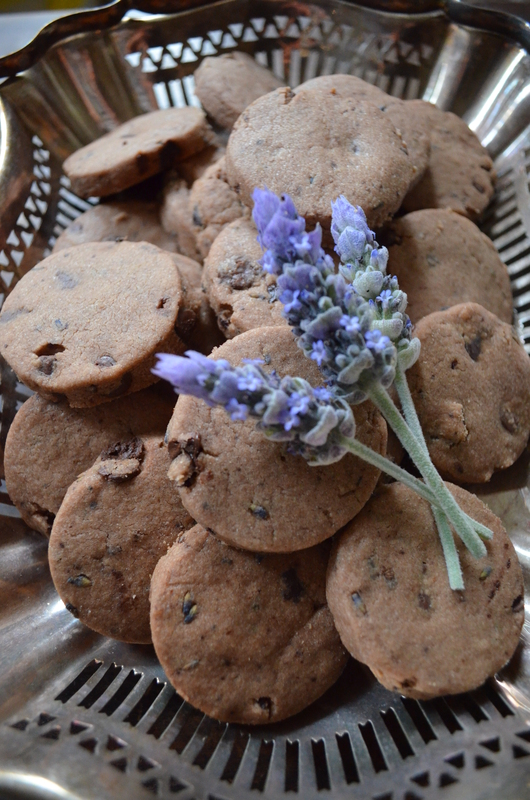 You can use either fresh lavender gathered from a garden that you know is pesticide free, or use the dried culinary version. Mine came from the dangerous store that is The Essential Ingredient. The floral flavour is subtle and unexpected, which brought most of my taste testers back for a second helping and a “what is that interesting flavour?”. 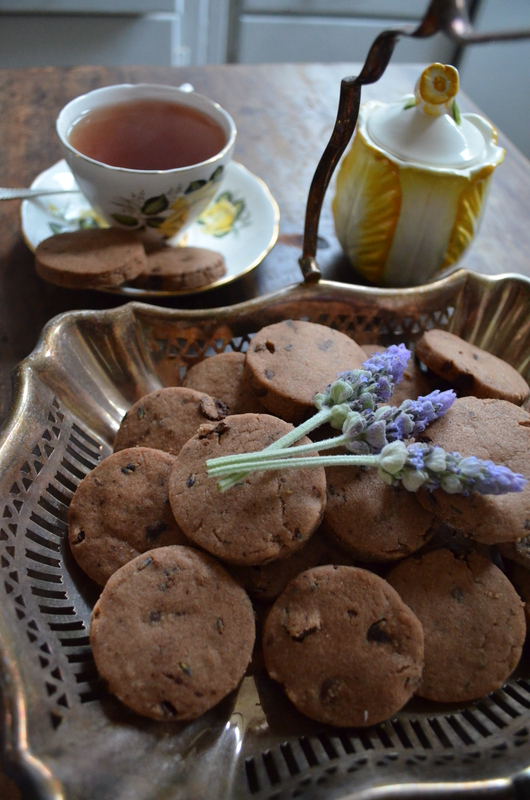 The best thing is, too, that the recipe makes 40-50 biscuits, so you can enjoy them in a big group or out of a jar with tea and a book at home. Speaking of books, The Tea Rose by Jennifer Donnelly and its sequels are the reason this post comes so long after the last one. It’s the fourth or fifth time I’ve read them and they are so amazing that they make me blind to all other pursuits! I’d love to hear your feedback on this recipe if you decide to give it a try! Thanks for reading becma bakes. 1. Sift dry ingredients into a large bowl and stir to combine. 2. 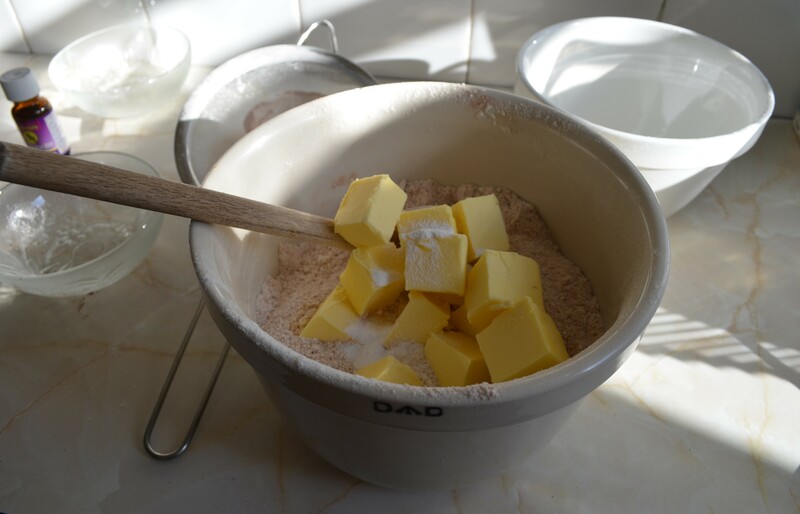 Add butter and rub in with the tips of your fingers until mixture is combined and has a crumbly texture. 4. 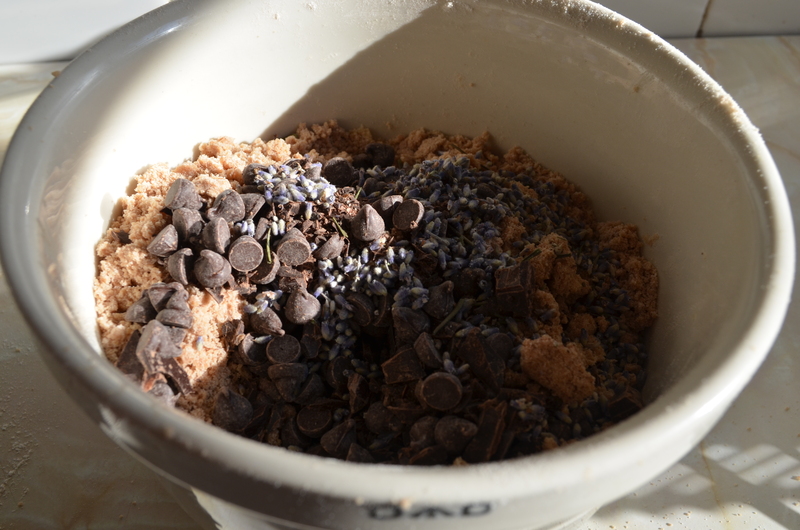 Add lavender elements and chocolate and mix into your shortbread base with a spoon or your fingers; whichever you find more easy. 4. Press mixture into a firm ball shape and wrap in cling wrap and place in the fridge for 15 minutes. 5. Meanwhile, heat oven to 180ºC and grease two large oven sheets. 6. Roll out your dough on a lightly floured surface and use a cookie cutter of your choice (in size & shape) to cut out your biscuits. Roll out and repeat until you’ve used as much of the dough as is practical. Check out the below picture- you really do get a good number for the work! 7. Bake for 20-25 minutes- they won’t go too brown and will firm up more as they cool, so be aware of the smells coming out of the oven to help you judge when they’re ready! 8. Cool on the trays and store in an airtight container. Enjoy at any time of the day- they are especially tasty with a cup of tea or coffee. 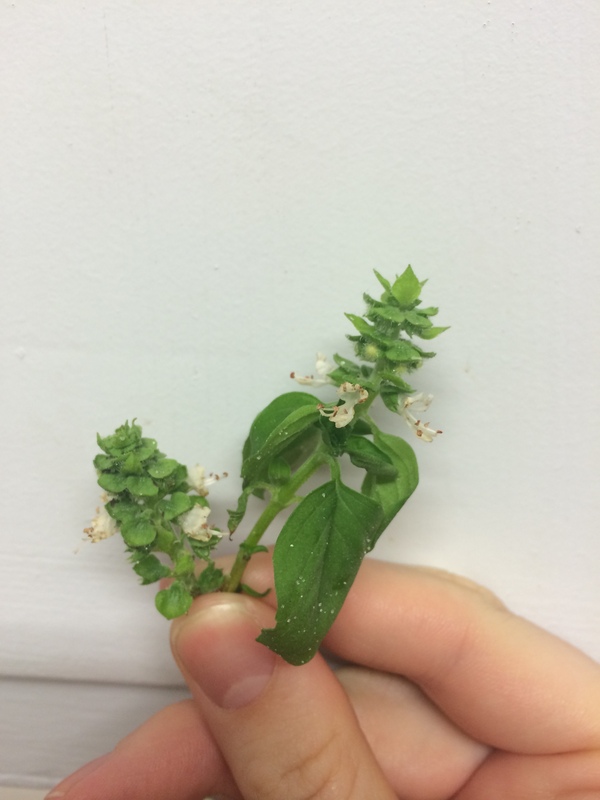 Our basil is in flower at the moment, and it inspired me to call my Grandma and ask for her Aunt Maise’s shortbread recipe – she’s been promising it to me for a while. 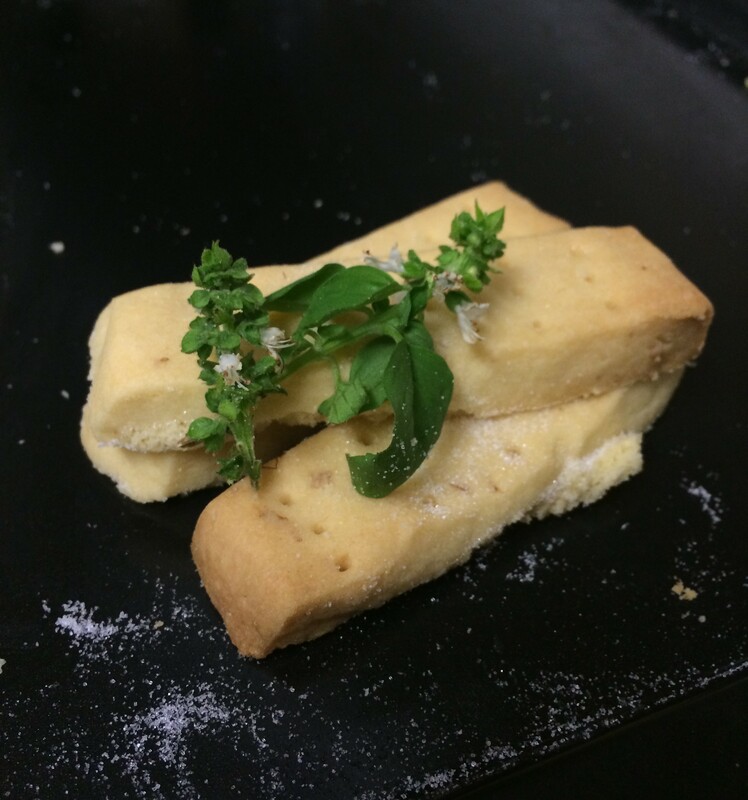 I’d read a recipe for herb flower shortbread in Cooking With Flowers by Miche Bacher (such a beautiful book), and thought I would combine that idea with the Scottish classic. 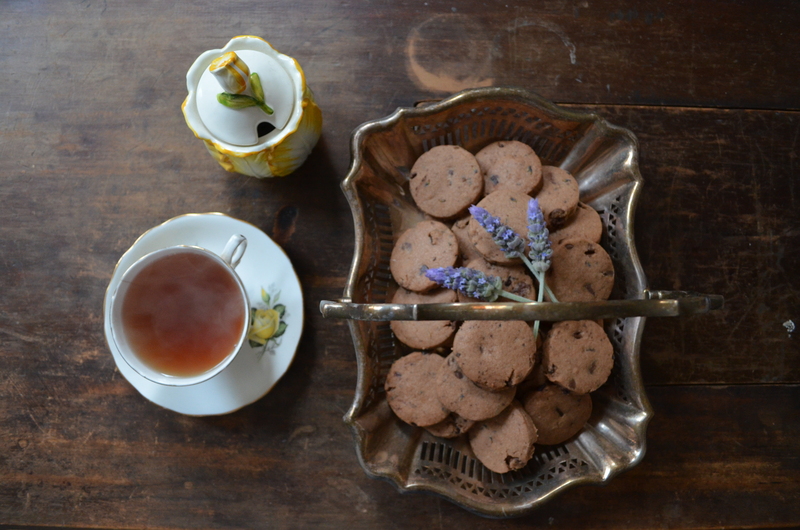 The basil flowers add a subtle point of difference to the otherwise familiar biscuits. If you prefer, the flowers can be left out altogether or exchanged for other herb flowers like rosemary, oregano or lavender, depending on what you have in the garden. I had my good headphones on for this bake and I must admit to grooving around the kitchen a whoooole lot while preparing and washing up. It was a Genesis and Led Zeppelin heavy shuffle. I exercised both days this weekend (including a 36km bike ride this morning!) and I think that’s why I feel super energetic tonight. 1. Sift dry ingredients into a large bowl. 2. Add butter to bowl and rub into dry ingredients using the tips of your fingers. This should take around 10 minutes and leave you with a well combined ball of dough, a bit like pastry. 3. Wrap the dough in cling wrap and refrigerate until firm, around 45 minutes. 4. Meanwhile, heat oven to 180ºC and grease a large oven sheet. 5. 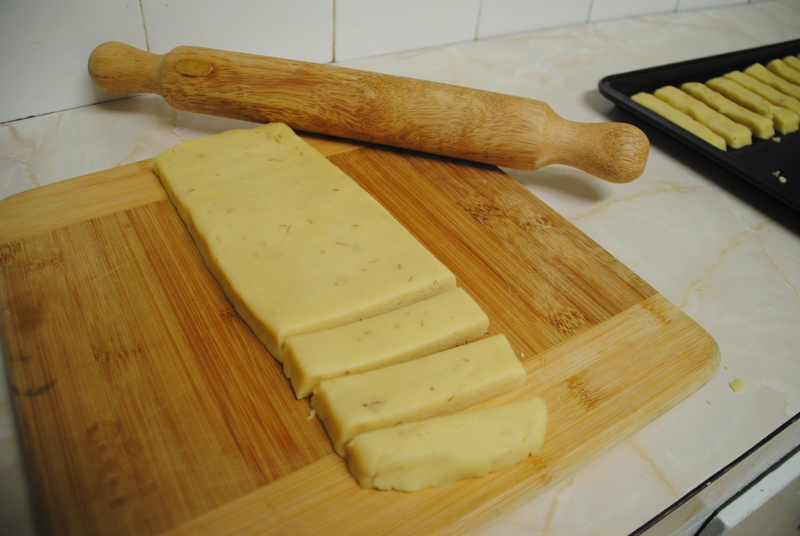 Cut chilled dough into two equal portions and roll out into rectangular lengths around 10cm wide. 6. 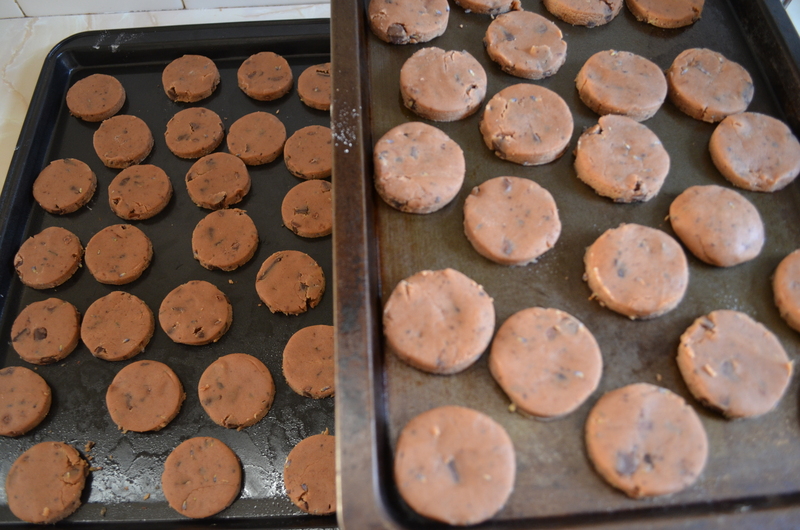 Cut into pieces around 2-3cm wide and place on the prepared tray. 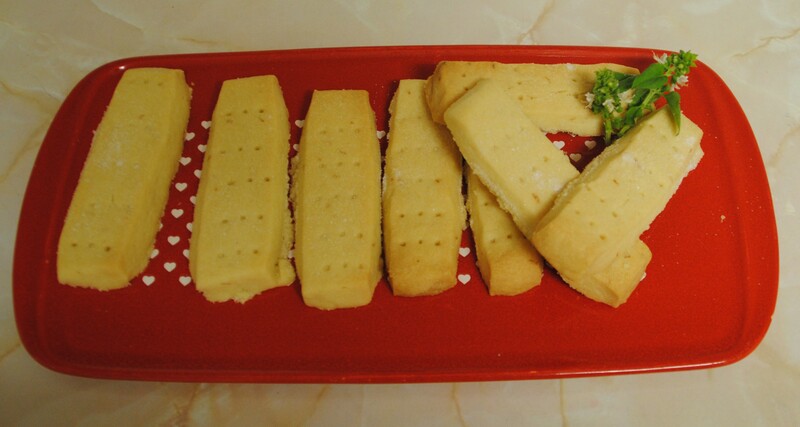 Prick biscuits with a fork and bake for 20-25 minutes, or until light golden. 7. Sprinkle biscuits with the extra sugar and allow to cool. Grandma used to make her shortbread for my Aunty and Uncle’s cafe and loves to tell the story of a chef who tried it and declared it the best he’d ever tasted. 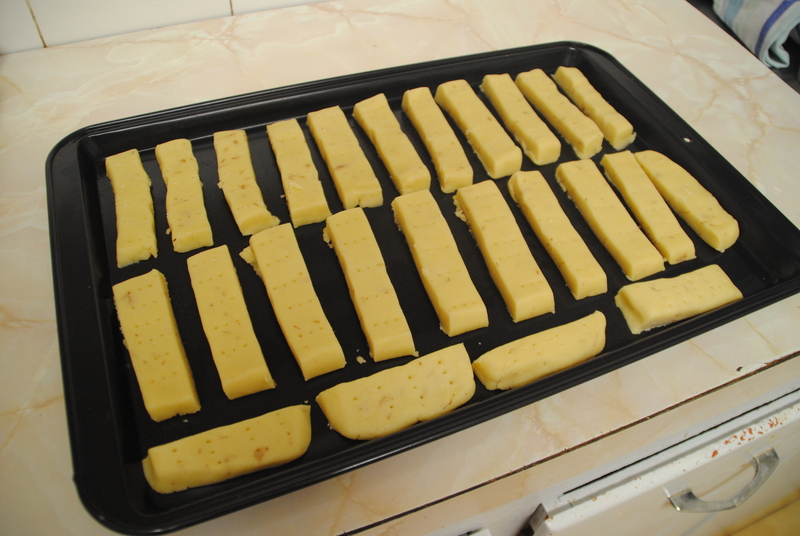 I realise that these photos aren’t the best, and I do apologise, but I think Grandma’s story should convince you to give this shortbread a try next time you’re after something easy for afternoon tea or lunches.